There's a continued movement towards independent chairs, according to EY Center for Corporate Board Matters research. "The shift to independent board leaders goes hand-in-hand with another governance shift over the same time period: a significant increase in independent directors. In 2000, 65% of S&P 1500 directors were considered independent vs. 83% in 2018," the research found. 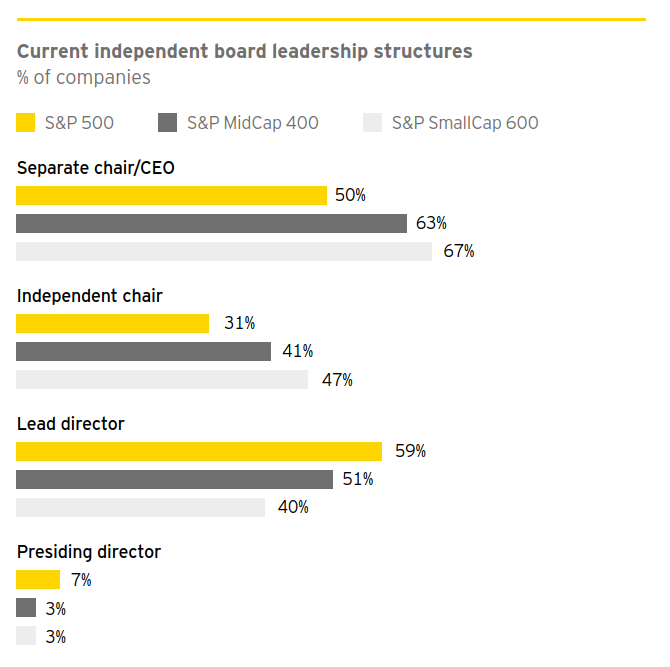 "Most S&P 1500 boards today include only one or two directors who are not independent, going well beyond listing standards that require a majority of independent directors. Even controlled companies, which are not required to have a majority independent board, usually comply with or exceed this threshold."